If you are one of the five people on the planet who have managed to stay away from any and all spoilers from The Walking Dead mid-season finale, consider this your giant, flaming SPOILER ALERT! As the latest casualty of the Zombie Apocalypse, Beth's death set off a flurry of fan commentary, and reading Emily Kinney's tearful interviews only added to the sense of loss we're all feeling in the aftermath. 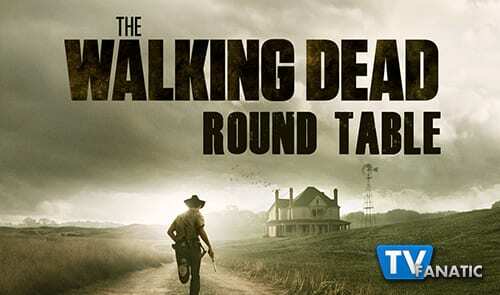 The Walking Dead Round Table panel is here to discuss her death and more, so join Whitney Evans, Carissa Pavlica, Sean McKenna, and Miranda Wicker from TVF and Eric Nordhoff from the Walker Stalkers by jumping into the comments below with your thoughts. 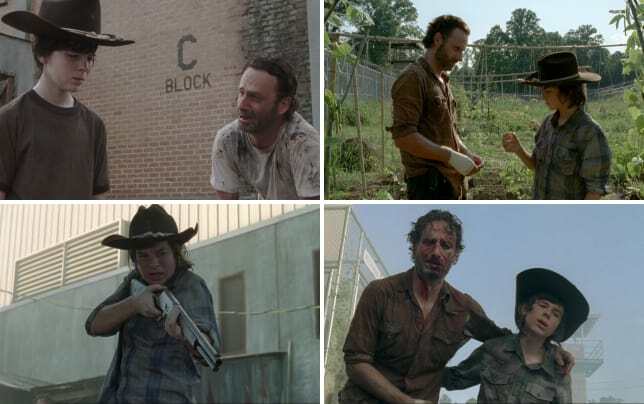 What was your favorite quote or scene from The Walking Dead Season 5 Episode 8? Whitney: My favorite scene was when the fire truck showed up just in time to rescue Michonne, Carl and Gabriel, who were just going to let the walkers come for them, I guess? Once those two groups merged, I was excited for them to head to Atlanta and get the whole band back together. Carissa: My favorite scene was seeing Gabriel crawling out from under the church alive because I wouldn't have believed it possible. I literally laughed out loud. How in the hell did the guy all of a sudden get guts just moments after whining like a baby as the walkers clawed at him? It required a lot of suspension of disbelief but turned out to be good comic relief. Eric: My favorite quote was Rick saying “Shut Up” after he just shot officer Lamson dead. The perfect line to say after a dramatic intro to the episode. Reminded me of something out of Raiders of the Lost Ark for some reason. My most memorable moment of the episode was Daryl holding Beth in his arms walking out of the hospital and seeing the tears and responses of the cast breaking down in tears seeing that Beth had been killed. Sean: My favorite scene had to be the hallway standoff. It certainly was the most intense moment of the hour, and while I had a feeling Beth wasn't going to make it out alive, I was still invested. There was just something about the claustrophobic corridor and way it was shot that had me engaged right until the tragic end. Miranda: Eric, I loved that moment with Rick. Coupled with his "I told you to stop..." it was just perfect. The trade scene on the roof was pretty awesome. "Where are your people?" BAM! "They're close..." When this group really works together, it's great. Runner-up scene goes to Rick welcoming anyone who wanted to join them to step forward. While I don't think anyone in the hospital took him up on his offer, that was a flash of early Rick who trusted people and wanted to help those outside his immediate group. Beth Greene is gone. What's your reaction? Whitney: It wasn't overly shocking that she died, but that didn't stop me from gasping when she got shot. The hallway scene was filmed beautifully and even though you just knew something bad was going to happen, it was still a shock when it ultimately did. Carissa: Not much at all, really. She's been on the chopping block for an entire season. Getting close to Daryl and getting to know her put her in harm's way. I has the privilege of meeting her at Comic-Con and she was so excited to be on the show and so sweet, I'm really sorry to see her go. 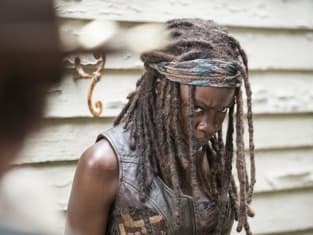 I wanted to see her and Daryl have the chance to reconnect and explore that relationship a bit more. It seems the more people connect, the less likely we'll ever see more of that. Eric: I’m sad. I wasn’t a big Beth fan up until this season. The way the writers setup her death was well done. It strikes me only now that Beth may have known that Dawn would shoot her. As you recall, she’s been contemplating suicide since Season 2. She’s been trying to find her way since then…she’s been up and down, but mostly a light for Daryl along the way. She represents an innocence lost to me. Her death was very sad, but I think deep down she was a very sad, almost depressed or manic depressive. This was maybe the way she wanted to go out. Why else would she have only stuck the scissors in Dawn’s chest and not at her throat or her eyes. Sean: I wasn't really surprised by her death, though the actual moment of the gunshot to her head was one. Certainly, she's come a long way since being just a backup character. Really, it was how everyone else around her was affected by her death. Just seeing Daryl's reaction especially or watching him carry her out (all set to some well timed music) really made it far more emotional of a moment. Though, I still wish she didn't just stick Dawn with the scissors in the first place... what else but death was going to happen? Miranda: I'm actually really upset that she died because I think, from a storytelling standpoint, it was cheap. While death is a part of life in a ZA, I don't adhere to the notion that a beloved character or a super evil villain must always die in every finale, mid-season or otherwise, so shooting Beth felt more like a way to write the character out of the script permanently and less justified or necessary. While I do think there's a possibility that Beth was broken by her stay there ("this is the way things are" coupled with her earlier suicide attempt lends credence to the thought that she wanted Dawn to shoot her) I don't think Beth wanted to die, or thought she would. If she did, it wasn't very clearly written, which further muddies the story. Ugh. I just don't like it. Pen a eulogy for Beth. Whitney: You were a sweet girl, Beth and it's a shame you had to go just when I was starting to warm up to you. I'm glad you got your own storyline and we were able to see the strong, capable young woman you turned into. Back in The Walking Dead season two, I would have never thought I'd miss you, but boy things have changed. Carissa: Your swan song wasn't complete without truly reuniting with the only person who cared for you, Daryl. I'm sorry you lost your father and your sister, making you a little harder than you needed to be before you were ready to handle it. Ya done good, kid. Eric: Beth was a light in this lost and dark world. You were pointing the way for all of us as we looked for anything good in this world. You had your father’s boldness. You had your father’s hope. The smile you gave to Noah as he got away and you were captured reminded us of that same smile he gave before the Governor took care of him. You will be missed, Beth. We will never forget you and the impact you had on all of our lives. Sean: Beth, you sang, you grew strong, you stabbed, you were gone. You've come so far since we first met you on the farm, but you'll be remembered no matter how far the survivors have trekked on. RIP Beth. Miranda: Beth, you were the bright light in a dark spot for so many of your people. You will not be soon forgotten. Sing on, little sister. Sing on. Better (worse?) breakdown: Maggie, Rick, or Daryl? Whitney: I've heard it discussed in many forums, but it did seem like Maggie forgot she had a sister for a while, so it's weird to say I was glad she had a breakdown but it was nice to see that emotion. Watching Daryl carry her out broke my heart, but Maggie's face was what really made me tear up. Carissa: Rick's entire demeanor during the rescue was really well done. The tears in his eyes while he attempted to remain strong for his group were heartbreaking. Daryl carrying Beth out lovingly was also killer. I don't care about Maggie. When she gave up on Beth, I gave up on her. Eric: Maggie, Rick and Daryl - all better. Daryl shooting Dawn was fitting because he was the one reluctant to violence together with Tyreece. However, he was the one who shot Dawn in heated revenge for killing Beth. So, he might be the only one worse - depending on your perspective. Sean: I think the one that most affected me was Daryl's, especially because of his time alone with Beth and his push to get her back. It just felt so real from his quick reaction to shoot Dawn to carrying out Beth. It was definitely a powerful performance. Miranda: Wait, Maggie and Beth were sisters?! Huh. Who knew!? Rick's teary blue eyes were piercing, but the worst breakdown award goes to Daryl. From here on, he'll be different, harder, and less trusting. I doubt we'll see him letting anyone else get close, which is pretty sad. I can still see him crying and it's making me want to cry. On a scale of 1 to 10, how happy are you to be rid of the hospital storyline? Whitney: Definitely 10! Dawn was awful, the cops were even worse and besides Noah and Beth, there was no one else there worth caring about. Carissa: Definitely 10. I missed it while I kept my eye on Daryl carrying Beth. Did anyone in there decide to take Rick up on his offer to join them? If I had been in the hospital and had the opportunity to see there are still people willing to fight for you instead of to have you and force you into slave labor, I would have gone in a heartbeat. Eric: 6. The hospital/police storyline was unique and different. I felt it was necessary to further the storyline and get the group out of southern Atlanta and begin their journey north, most likely to Noah’s Richmond area (Alexandria in the comic). This was way better than the Prison illness series of episodes from last season. Anything is better than those series of 4 or 5 episodes. Sean: I was initially intrigued by the hospital arc but definitely grew tired of it. I couldn't even keep any of the random characters there straight. This cop, that cop, etc. It'd be a 10 at this point, but at least the show isn't dragging it out to 2015. Miranda: I didn't want to see it drag on into eternity, but I was kind of hoping Rick and the crew would take out the cops and free the prisoner-patients while also using a little bit of time to rest and recuperate. There's food and medicine there, a little electricity, BEDS to sleep in. They need it, and without the urgency to get to Washington, they have time. Time is pretty much all they have. What are your hopes for the series when it returns in February? Whitney: I'm not a comic book reader, so I have no idea where they're headed next or who the new big bad will be. I think when Morgan eventually meets up with the group he will bring an interesting dynamic and I'm anxious to see that. Carissa: I have no idea where the comics are going, but if it's like the series, it's nowhere fast. I'm tired of Georgia. I don't mind the slow burn, but I wish they had a point. A plan to go somewhere or to settle down for a bit. The best installments for me are when we have a chance for people to bond. The Daryl/Beth, Carol/Tyrese, Rick/Carl and recently Carol/Daryl have been some of my favorites. As much as I hated the Governor, trying to establish a safe place to resume a normal life if only to regroup from all of the losses would be welcome. Eric: Robert Kirkman mentioned that we will meet a prominent gay character from the comics in the second half of The Walking Dead season 5. I am very eager to see who they cast because that character is pretty badass in the comic. I’m excited to see the group move on up north. I’d like to see some of these questions answered: Does a new love interest emerge for Rick? Sean: I'd like to see Morgan again, but beyond that I don't have any particular hopes. I'd of course love to see them get out of Georgia, but I doubt that will happen. So maybe, more development of the other characters, and not just before they are about to die. I don't know, I'm just hoping the final run of episodes for The Walking Dead Season 5 are both engaging and exciting all the way through. But isn't that what we all pretty much want? We have a couple of months before new episodes begin, but you can always watch The Walking Dead online to get your Zombie Apocalypse fill.